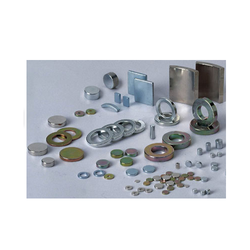 We are manufacturers and exporters of various types of Industrial Magnets customized magnets, ndfeb magnets, suspended magnets and cast alnico magnet - wb-alnico. Ceramic Magnets (Ferrite), are composed of strontium carbonate and iron oxide. They are charcoal gray in color and usually appear in the forms of discs, rings, blocks, cylinders, and sometimes arcs for motors. Since ceramic material is so brittle, it requires special machining techniques and equipment. We are fully equipped to cut and grind ceramic material to your specifications. With the help of our expert professionals, we have been able to offer Cast Alnico Magnet. Manufactured using superior quality raw material, these pot magnets are known for their durability. These products have permanent magnet, which is enclosed in a metal pot and the active face of the magnet is not enclosed. Cast Alnico Magnet (composed predominantly of aluminum, nickel, and cobalt with minor amounts of other elements including titanium and copper) permit design latitudes providing high indications. Max. Operating Temperatures 80 degree cel. 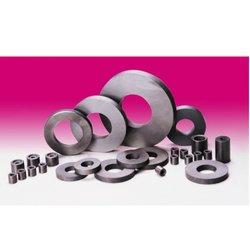 As well recognized in the industry, magnet are one of the most essential materials. 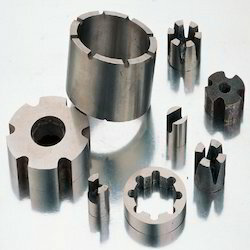 Neodymium Iron Boron Magnets (NdFeB Magnets). magnets are used most popular by people in industry and our daily life, because it has superior magnetic properties than other kind of magnets. Higher unit magnetic properties than other magnets and assure you of smaller size and lighter weight in designing devices. Being mostly an iron based alloy, NdFeB type rare earth magnets is much more prone to surface oxidation or rust. To eliminate such a problem, the user should consider magnet coating, plating, or suitable surface treatment. Lower temperature coefficient of magnetic properties then ceramic but higher than SmCo type rare earth magnets. Therefore, NdFeB type rare earth magnets will suffer irreversible loss at high temperature.